Info "Tap and stretch the tongue to gobble up the candy, then let go to send it snapping back into his mouth!" 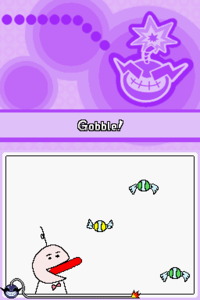 Sugar Rush is a microgame in the Total Drag stage in WarioWare: Touched! The microgame name is a reference to the term where a person goes into hyperactivity after eating too much sugary food. The objective of the game is to drag and pull the tongue from the mouth of the baby to the candy pieces floating to his right. Releasing it, the player snap them into his mouth. 1st level difficulty: There are three pieces of candy to gobble up. 2nd level difficulty: There are three moving pieces of candy to gobble up. 3rd level difficulty: There are five pieces of candy to gobble up. Stylus – Tap to extend tongue. This page was last edited on April 6, 2018, at 18:29.